Apr. 3 (NBD) -- How many steps could it take to order a pair of Converse Chuck 70 shoes? Third, pray to be picked as the lucky buyer by the shop. In a Converse store in Jining, in the southwest of east China's Shandong Province, consumers were required to draw lots to purchase black Chuck 70 High Top, which incurs public wrath on Tuesday. Converse released an apology letter on its social media account on the same day, claiming that it didn't engage in and will never encourage any speculation. The brand has contacted the dealer involved to cancel the lottery for non joint-developed collection. Recently, a nationwide shortage of Chuck 70 shoes took place as the products are well received by Chinese customers and it will scale up production to satisfy the market demand, the letter said. The move, however, didn't quell consumers' discontentment. Some revealed they are not allowed to buy Chuck 70 High Top unless they selected another two pairs from basic collections. "The salesperson said the shoes are sold too well, and the new rule prevents the products from being snapped up once released," a person recalled on the Internet. According to Converse's announcement, it has banned all forcible product bundling. In fact, shoes brands including Nike, Adidas and Li-Ning also ask consumers to attend lottery for limited-edition shoes and to dress in clothes of their own brand when participating the promo events. 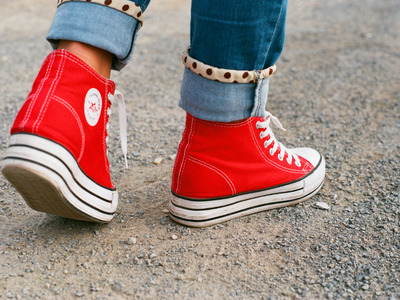 Besides, Converse is not the pioneer to adopt the "unspoken rules" of product sales. "In a luxury retail store, if you settle on a 50,000-yuan (7441.1-U.S. dollar) luxury bag, you need to pick out some other goods worth tens of thousands yuan to over a hundred thousand yuan. The amount varies depending on the brand, the store's location and the salesperson," a leather restorer from a luxury brand said. For French high fashion firm Hermes, the ratio of a certain product to additional accessories bundled is between 1:0.5 and 1:2. Nevertheless, the new incident could further cast a pall over Converse's brand image and sales performance. Acquired by Nike for 305 million U.S. dollars in 2003, the 111-year-old Converse, boasting brand advantage and classic canvas design, has set a fashion trend among young generation. But as sports apparel turns into a highly popular style of dressing, Vans, Puma and other sportswear players promptly occupy the market. Consequently, Converse has suffered slipping financial results since 2016, resulting from over-reliance on its classic Chuck Taylor All Star series. While Nike's annual sales in fiscal 2018 hit 36.4 billion U.S. dollars, the figure for Converse fell by 11 percent to 1.89 billion U.S. dollars, failing to reach the 2-billion-U.S. dollar mark and even worse than that of fiscal 2015. Last year, among Gen Z consumers aged from 13 to 20, the number of youngsters holding interests in Converse posted a drop of 18 percent from five years ago, a report released by data analysis platform Engagement Labs shows.